Cost overruns can have a crushing effect on those who negotiate building contracts. They can turn something that at first seemed a good, affordable investment into a budgetary nightmare, one that weakens financial foundations. It’s the same for an ordinary homeowner trying to build an extension onto the family homestead as it is for a Government making a major infrastructural investment. Bad planning, design changes, lousy financial control, disputes and wasted time can get up to doubling the bill before you know it. That’s a situation that’s bitten us big-time in Bermuda. Who doesn’t remember the long list of building projects whose cost increases made Auditors General so furious? Tynes Bay, Westgate, the new senior secondary school, the Magistrates Court Building, the Port Royal Golf Course, the new TCD building and Heritage Wharf in Dockyard were all on that list of projects that resulted in big overruns. People think of the amounts involved as abstract, just numbers on an accountant’s balance sheet. But that’s not the true picture at all. Those numbers represent real dollars…. dollars wasted, but dollars that could easily have been spent to make better-equipped schools, an easier life for seniors, better healthcare, better roads, better buses… dollars that could have eased any of the infrastructural problems that are causing Bermudians pain right now. This is a small Island, with a small government and a small budget. But our troubles can be as big as any country’s. When we make mistakes, they go straight to the country’s bottom line, which is our people, from our youngest to our oldest. If you were cynical, you might say that mistakes happen to the best of us! Maybe. But as a small country, we have to learn from our mistakes. The Interim contract of the Bermuda Government with the Canadian Government to build our new airport was published a short time ago. Probably not too many people have read it. It’s long and very, very detailed. Doesn’t make easy reading at all. But here’s what you can take away from it. First, its length and detail mean that Government and CCC are working hard to make sure they don’t make mistakes. Their lengthy and tough negotiation over every single little detail is the planning process at its best. This is Bermuda learning from the mistakes of the past. No one should be surprised. There’s a fire under the feet of both the Bermuda and the Canadian Governments. As a Canadian Government entity, CCC has given its guarantee that the project will be delivered according to the terms and conditions of the contract – on budget, on time and on spec. Peace of mind… guaranteed! As the Finance Minister, ET ‘Bob’ Richards has said, that guarantee is worth its weight in gold. It’s also unusual to be able to read a document like this. Publishing it is a reaction to the extraordinary level of public interest in the project. Some have said that the fact that the annexes have so far been kept secret is proof that the Government lacks the will to be transparent about this project. That’s simply not true. Publishing the interim contract to be agreed upon is proof that the Government is willing to be transparent. Redacting the annexes at this point in the negotiation process, is evidence that the Government understands that in commercial negotiations, some items are covered under Non-Disclosure Agreements. This is normal business practice. Certainly there are details that have not been made available at this time. As stated above, the negotiation process has been thorough, with every matter being considered to ensure the best deal for everyone. Until this process is complete and the contract is agreed upon, decisions on some issues, such as revenue sharing, will not be finalised. The airport is to be a public/ private project, in which capital costs for the airport redevelopment will be financed by private investors and lenders utilizing airport revenues – meaning airport users, not taxes or new government debt, pay for the new infrastructure. Typically, construction cost overruns are one of the risks that can plague large public infrastructure projects; driving up financing costs and adding to the burden of government debt. 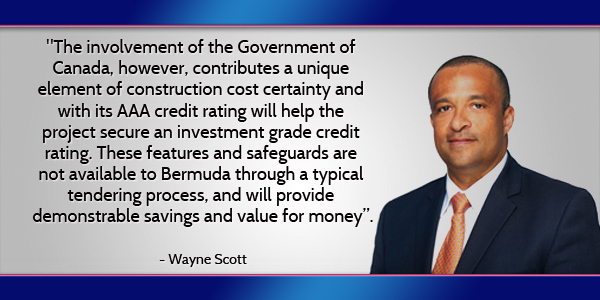 The involvement of the Government of Canada, however, contributes a unique element of construction cost certainty and with its AAA credit rating will help the project secure an investment grade credit rating. These features and safeguards are not available to Bermuda through a typical tendering process, and will provide demonstrable savings and “value for money”. In contrast, the new wing of the King Edward VII Memorial Hospital was another infrastructural public/ private project in Bermuda. One Bermuda Alliance Senator Georgia Marshall found, with some difficulty, a copy of the contract between the Bermuda Government and the contractor, which has never been released to the public. She found that these financial details had largely been redacted, or blacklined, to keep them from public scrutiny. Even details of the ownership of Paget Health Services, with whom the Government partnered to design and build the new wing, were kept secret. Is that what you’d call transparency? It’s time that we recognize, Bermuda, that we are better and stronger together, and that everything does not have to be political. Answers to some questions regarding the airport redevelopment project are available at the government portal here. Thank you Minister. Now can you provide for the people an update on the governments efforts to address all of the issues raised in the Deloitte report. With the deficiencies that have to addressed, they can only really be sorted in the format of the final contract, so until it is finalized and reviewed by the independent reviewer and Foreign Office, there is little that can be said about them being addressed other than that they are being addressed. https://www.youtube.com/watch?v=8cKYK2q-c4M this is how it all went down. It’simply amazing how politicians can go to extremes in order to justify the damnedest ideas. Listen to the Donald and you’ll hear that. Here, this MP has seized on the single issue of avoiding cost over-runs as the justification for doing a project that is financially unaffordable, of doubtful necessity, and appears to be a scheme put together by a Canadian mega-corporation and sold to a small country bumpkin. There was a 2006 ‘study’ on the airport. That ‘study’ never ever considered the question: “Is a new airport necessary?” Instead, that “study” led off with the ‘fact’ that “Bermuda needs a new airport.” No one ever explored the substantial issue of “what exactly does Bermuda need now, and in the reasonable future, from its airport.” No one, no one at all, asked or answered that question. So here we are, some Bermuda politicians working their political butts off in order to make and justify a stupid, really stupid, big financial mistake. As if we haven’t made enough of those over the past ten years. The singular flaw in this AECON deal, as proposed, is that the Government of Bermuda is working damned hard to give away thirty years of desperately needed Revenue. Revenue – not new builds – is this Government, and the next Government’s most pressing need. For Heaven’s sake, somebody wake up and see that giving away over $600 million in future revenue is the wrongest thing to do. Even as I write this, this Government is trying to borrow, yes borrow, another couple of hundred million just so it can get through to March next year. How do we know that? That’s what Parliament was told would be happening. Parliament and all the rest of us have were told, by the Minister himself, that Bermuda would be borrowing at least another $150 million in this financial year! And that’s after borrowing $800 million in 2013, and another $200 million in 2015, and now we’re lining up to borrow another $150 million in 2016. If the Government took your advice we would have a hefty tax increase ( revenue) in all areas . Of course this one sided approach does not work as there has to be balance if not the side providing the tax disappears so the effect is no revenue. Balance allows some revenue to be used to get bigger value for money. $600M is nothing over thirty years – it would not pay the interest on the interest we owe. Just so you know we pay ten+ million a month ( A MONTH) on debt service. So what do we get for $20M a year ? We get a new airport maintained and run for 30 years. We get jobs for Bermudians in construction and operations. We get external funds entering the BDA economy via the construction of the project. We get this with no additional debt burden. There is no free lunch so yes the people risking THEIR money will get a reasonable return but their guarantor ( Canadian Government) will hold them accountable both in financial and reputational matters. If you take the politics out of this it is the best deal we are going to get in decades. It is better controls then any project in the last 20 years in this country. There are so many assumed, misleading or false statements in your response, there simply isn’t the space to respond other than to say, research what is actually known, all of what is known and not just someone’s agenda fed snippets, and your statement falls flat.